Sponsored article: The Weidt Group shares recent research on energy modeling. Energy modeling is the most effective way we have to optimize energy efficiency for each unique building, but it is severely underused. 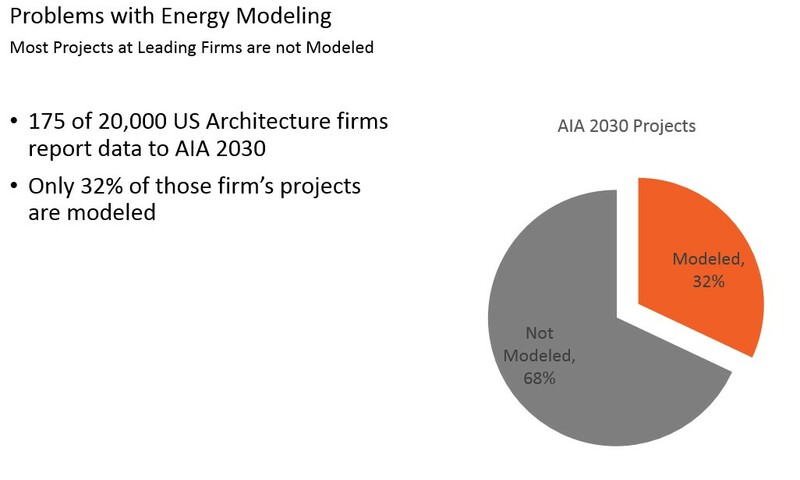 Even among the self-selected 175 firms that report on the energy use of their designs for AIA 2030, only 32 percent of the projects include energy modeling at all, and even fewer complete modeling early enough to inform the design. Graphic by The Weidt Group. Doug Wolf, of The Weidt Group, and Supriya Goel, of Pacific Northwest National Laboratory, recently presented the paper “A Simplified Energy Modeling Approach to Buildings,” exploring how a simplified energy modeling process could decrease the time and costs to do modeling while maintaining accuracy. The paper was presented to the 2018 Performance Analysis Conference and SimBuild, co-organized by ASHRAE and IBPSA-USA. It proposes a way to validate model simplifications by comparing simplified energy models to the Department of Energy’s Reference Buildings across building type and climate zones. The authors presented a sample validation of two tools for a single building type. Simplified energy modeling could inform the energy decision-making of the vast majority of projects that currently receive no energy modeling, moving the design industry from rules of thumb to data-driven decisions.